My parents are Edward and Joan Cannon and I am their second of seven children all of whom are married with children with the exception of my older brother who is also a priest. He was the pastor of St. John the Baptist Parish in Quincy but was transferred to St. John the Evangelist Parish, Hopkinton, MA.. I was baptized at Our Lady Help of Christians in Newton but I received my other sacraments at St. Thomas the Apostle Parish in Millis where I grew up. My family has always been an important part of my life and a great source of support for me. After high school I attended the University of Massachusetts at Amherst where I received a degree in marketing. I worked for a few years in sales and marketing before returning to school to obtain my M.B.A. degree, which I received from the University of Colorado at Boulder with a concentration in finance. Following graduation I continued to work in sales and marketing for seven years before joining the Xaverian Missionaries in 1991 when I entered their postulancy program. After completing a year of postulancy in Franklin, Wisconsin, I began my theological studies at Catholic Theological Union in Chicago before leaving for Ancona, Italy, where I did one year of novitiate. I returned to Chicago as a temporarily professed brother and completed my studies at C.T.U. receiving a M.Div. degree. With the conclusion of my studies, I was ordained a priest in 1997 in my home parish of St. Thomas the Apostle in Millis and I was then sent to the Philippines where I lived in Metro-Manila ministering to a large community of squatters, poor families who settle on unoccupied land. In addition I was part of the formation team for our theological students who were studying in Manila. Because of health reasons I had to return to the United States where I have resided ever since. In 2002 I was appointed rector of our community in Holliston. In 2004 I felt the call to become more active in parish life and I entered a process known as incardination which ultimately made me a priest of the Archdiocese of Boston. During this process I was made a parochial vicar at St. John the Evangelist Parish in Hopkinton where I remained for a little over two years. I was then sent to Holy Family Parish in Duxbury where I spent about two and half years before being made pastor of St. Mary of the Nativity Parish in Scituate on June 1, 2009. Just prior to my appointment I was officially incardinated into the Archdiocese of Boston on May 7, 2009. I was born in 1935 in Roxbury and grew up in Dorchester and Milton. I graduated from BC High in 1953 at the same time working in construction as an iron worker in Boston. I then attended Holy Cross College for two years until I entered St. John's Seminary for studies until ordination in 1961. After working in Boston for 15 years as a priest in Arlington, Wellesley, Beverly and Revere, I felt called to serve the poor on the missions in South America with the Society of St. James. Before going to the missions I graduated from Salem State with a Master Degree in Education, also receiving M. Div. from St. John's Seminary. In 1976, I left for Peru to study Spanish and was then assigned to work in Bolivia with the Quechua and Aymara Indians in the altiplano at an altitude of 15,000 feet. In Bolivia, the poorest country in So. America, for 15 years, I worked from a parish center, Paria, serving more than 50 Indian villages. After I grew in age, wisdom and grace from the mountain experience, I moved on to work in the mountains of Ecuador outside of Quito at the altitude of only 10,000 feet where I established and built a new parish with seven churches, a medical center, several education centers, three food centers for children and elderly etc. In the meantime, I came to Boston as Director of the Society of St. James for three years then returned to Ecuador until 2012. Back in Boston after 36 years, I was invited by Fr. 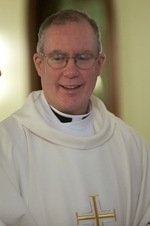 Ken Cannon to live and help as a senior priest in St. Mary's Parish in Scituate. Hopefully, the mission experience will help me in continuing to proclaim the Kingdom of God and the Gospel of faith and love that I learned in South America. I was born in a small town in the west of Ireland and came here with my parents and two brothers in the early seventies. For almost 20 years, I was a member of Noel Henry's Irish Show Band and we traveled extensively around the United States. In addition, my wife Mary and I ran an Irish music distribution company supplying Irish Import and religious gift shops throughout the country. Mary is originally from St. Margaret's parish in Dorchester. Both her parents were from Ireland and we have been married for over 34 years and have 2 children. Our son, Marty, is married, living in Chicago and has 2 children, Ava and Allie. Our daughter Erin is in musical theatre and lives in New York. I was ordained a deacon in September, 2006 and my first assignment was at Our Lady of the Lake in Halifax. Shortly after ordination, I began working for the Archdiocese of Boston as a chaplain and the coordinator of Catholic pastoral care at South Shore Hospital. I consider it a true privilege and blessing to be able to minister to God's people as a deacon here at St. Mary's, and along with my wife Mary, to be part of this wonderful community dedicated to Our Lady.